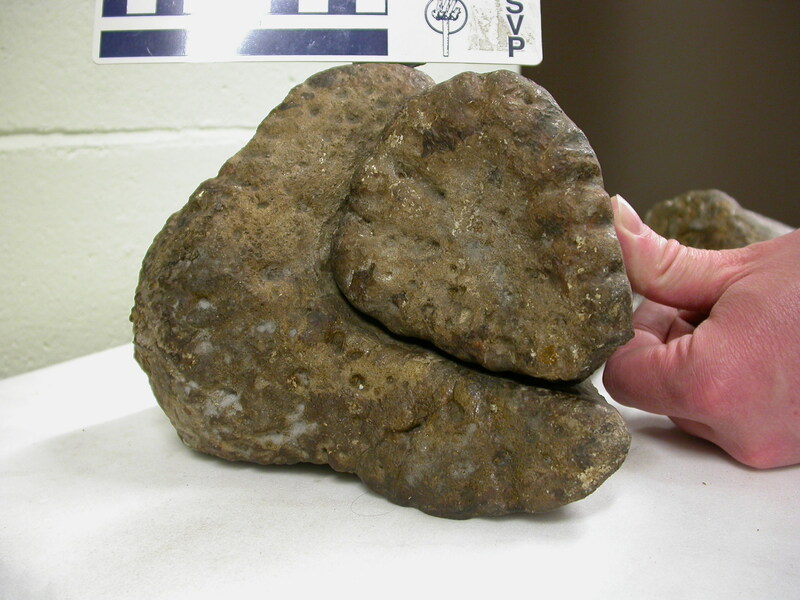 What about the forearm of “Pelorosaurus” becklesii? 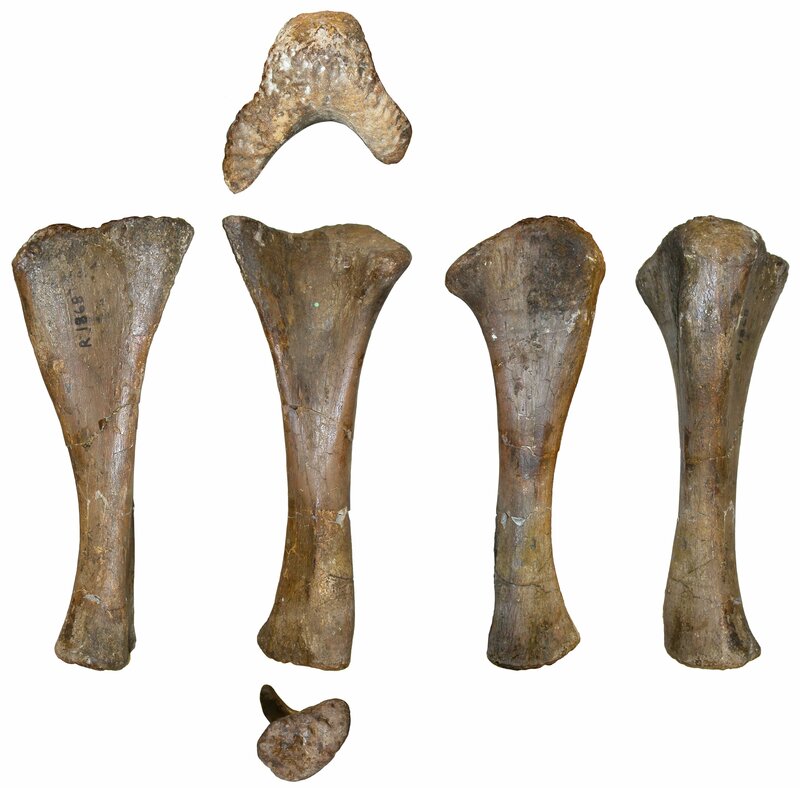 Yesterday, we looked at (mostly) the humerus of the Wealden sauropod “Pelorosaurus” becklesii, which you will recall is known from humerus, radius, ulna and a skin impression, and — whatever it might be — is certainly not a species of Pelorosaurus. Now let’s look at the radius and ulna. Left forearm of “Pelorosaurus” becklesii holotype NHMUK R1870, articulated, in anterior view, with proximal to the left: radius in front, ulna behind. They fit together pretty neatly: the proximal part of the radius is a rounded triangular shape, and it slots into the triangular gap between the anteromedial and anterolateral processes of the proximal part of the ulna. Left forearm of “Pelorosaurus” becklesii holotype NHMUK R1870 in proximal view, with anterior to the right. The “arms” of the ulna enclose the radius. 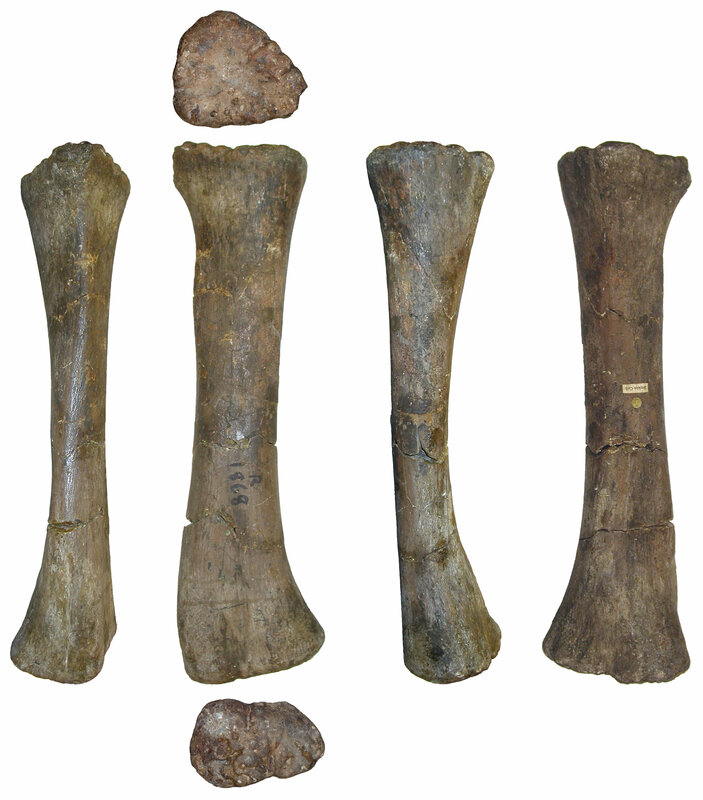 Left ulna of “Pelorosaurus” becklesii holotype NHMUK R1870. Top row: proximal view, with anterior to the bottom. Middle row, from left to right: medial, anterior, lateral and posterior views. Bottom row: distal view, with anterior to top. Left radius of “Pelorosaurus” becklesii holotype NHMUK R1870. Top row: proximal view, with anterior to the bottom. Middle row, from left to right: medial, anterior, lateral and posterior views. Bottom row: distal view, with anterior to top. As you can see, it’s pretty well preserved: there’s no evidence of significant crushing in any of the bones, and the 3d shape is apparent. In short, it’s a really sweet specimen. Someone really ought to get around to describing it properly, and giving it the new generic name that it clearly warrants. Beautiful. The texture is visible and seems fresh. The broken areas provide opportunity to observe the interior structure. Am I looking at marrow? That seems unlikely. Could you please comment about the layers visible in the cracks? Are the surfaces of the joints typical? They seem a bit arthritic. Thank you for the ‘big picture’. Is there a close-up of that crack available? A very nice specimen. Thanks. Well, Frosted Flake, I don’t know about marrow, but that would be the obvious interpretation of what we’re seeing at the broken ends. (Note: this refers to an image in the previous post, not this one.) I’m really not the person to comment on the detail in the cross-sections, though. Do we get to see the skin impression? ‘Marrow’ would refer to a soft tissue, so that’s probably not what we’re seeing on the previous post. I don’t know from sauropod limbs, but the mineral infill seems to be in a simple tubular cavity rather than (e.g.) the interspaces of trabecular bone, but that’s to be expected at mid-shaft in any group, probably. Bones broken open before burial would get filled with mud which usually ends up pretty much the same as the matrix outside. But assuming the matrix is more or less calcareous (expected for Wealden, yes? ), an intact bone will have its internal cavities filled mainly with crystalline calcite, the insoluble sediment particles being filtered out by the bone. In the cross-sections the crystals appear to be bimodal in size and colour, but I suspect the yellow material is actually old glue rather than a different mineral. Other stuff (organic residues, iron and manganese oxides etc.) gets concentrated in the gaps between the calcite crystals, often as dendrites, lending a lot of black. « Whatever happened to “Pelorosaurus” becklesii?